Week 8 of the Great British Bake Off brought us Danish Week which has proved to be quite testing but we love a challenge and we have come up with a lighter version of the traditional Danish rye bread (or Rugbrød). 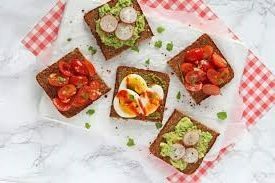 The Danes are well known for their rye bread and there are many different varieties, most of which are quite sweet and dense and loaded with seeds. Rye bread is filling as it contains more fibre than white bread making it a nutritious, healthy alternative. It doesn’t spike blood sugar levels which can lead to uncontrollable hunger pangs and loss of energy. Our version doesn’t contain seeds, but feel free to add in sunflower seeds, pumpkin seeds, chopped almonds and flaxseeds! 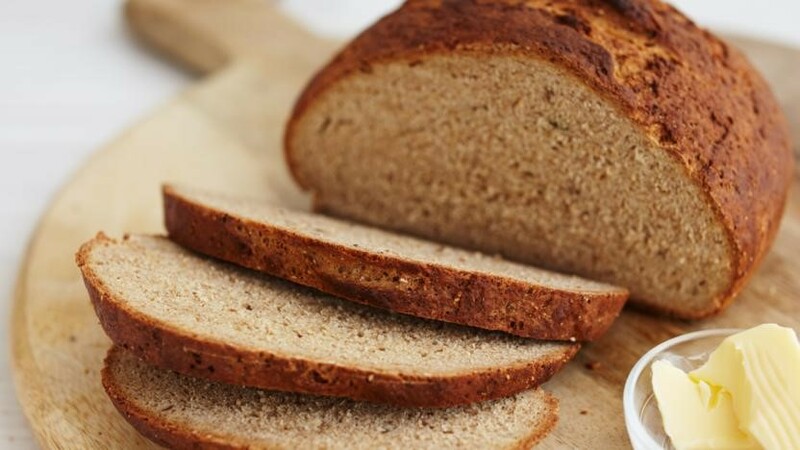 We’ve even given you some delicious topping ideas for your rye bread! Perfect for a light lunch or a snack. Mix the honey with 250ml warm water in a jug and pour the liquid into the bowl. Mix to form a dough adding a little more water if necessary until you have a soft dough. Lightly flour a work surface and knead the dough for 10 minutes until smooth. Place in a well-oiled bowl, cover with cling film and leave to rise in a warm place for 1-2 hrs, or until roughly doubled in size. Dust a 900g loaf tin with flour. When the dough is well risen, place onto the work surface and knead briefly to knock out any air bubbles. Shape into a smooth oval loaf and place into the loaf tin. Cover the tin with oiled cling film or a damp tea towel and leave to rise somewhere warm for a further 1 – 1 ½ hours, or until doubled in size. Heat oven to 220°C. Remove the cling film and dust the surface of the loaf with rye flour. Make a few slits on the top with a knife and place in the hot oven. Mash the avocado and spread it onto two slices of rye bread. Squeeze some fresh lime juice over, and top with thin slices of radish. Spread the pesto onto two slices of rye bread. Add a sliced boiled egg on each and drizzle some chilli sauce on the top. Chop the cherry tomatoes and place in a bowl. Add the crushed garlic, some torn basil leaves and a little olive oil and stir. Divide between two slices of rye bread. Season all three with salt and pepper.